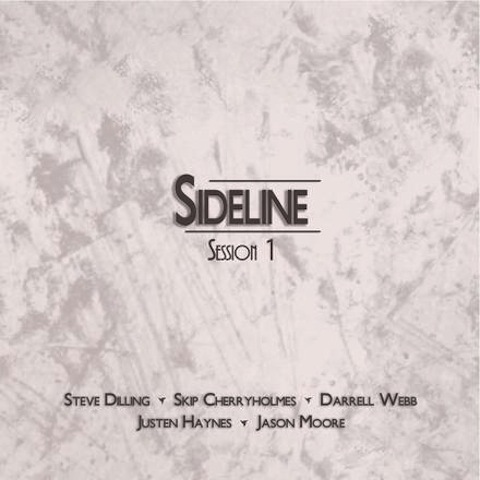 Longtime bluegrass stalwarts Steve Dilling, Skip Cherryholmes, Darrell Webb, Justen Haynes and Jason Moore have joined forces on their first album, Sideline Session 1, being released by Mountain Fever Records today. The group is a gathering of some of bluegrass music’s most mastered talents. The idea of a collaboration project is becoming more and more common in the bluegrass world. Sometimes it’s a solo project from a member of an established band; other times it’s an all-star effort involving a bevy of popular artists. But sometimes it’s an actual band, who performs irregularly, as its members all tour and record with other groups full-time. With Dilling on banjo/vocals, Cherryholmes on Guitar/Vocals, Webb on Mandolin/Vocal, Justen Haynes on Fiddle and Jason Moore on bass, SIDELINE is one such group. The album showcases each player’s talents on songs such as “Loneliness & Desperation,” “Little Willie,” “What Made Milwaukee Famous,” “Goodbye To The Blues,” “Old Joe Clark Blues,” “The Blues Are Still The Blues,” “When You’re Lonely,” “I Wonder If Our Love Is The Healing Kind,” “The Way, The Truth,” “The Light,” “Girl At The Crossroads Bar” and “Sophronie”. Steve Dillings says, “I am so excited about the release of this CD. It’s a collaboration between a group of musicians that love traditional bluegrass music, and play and feel the same groove. I feel that we showed that in this recording – Steve Dilling. Aptly named, Sideline started several years ago as an enjoyable side project to do in the month of December, when work for bluegrass bands is in short supply. So much so that eternal road warriors IIIrd Tyme Out take the entire month off. A nice perk given their heavy travel schedule the rest of the year. Not everyone wants to give up picking for an entire month however, so each year 3TO banjo player Steve Dilling would assemble a group of musicians to do a series of special concerts during the holiday season. Two years ago that solidified into a regular lineup and after realizing how much they enjoyed playing together and performing a few late night showcases during the 2011 World of Bluegrass conference, this group of musicians, also known as Sideline, has cut their debut album. Darrell Webb fronts his own band, as does Cherryholmes, and Jason Moore is a regular member of Mountain Heart and tours with Audie Blaylock. With Dilling and Haynes touring with IIIrd Tyme Out, Sideline doesn’t have many opportunities to tour as a unit but as they receive support from their regular touring groups, they hope to grab some time to play when their various bands are scheduled at the same event or during down times of the year. Visit Sideline on Facebook or visit Airplay Direct.